Sometimes you love a game so much you've just gotta create a short animated holiday special based on it, and so we have Wind-up Dog Animation's short but sweet Shovel Knight Animated Holiday Special. I love that we live in a time when folks with a little spare time on their hands and some love in their hearts can whip-up fan animations ten times better than the stuff we used to have to wait until Saturday to watch when I was a kid. 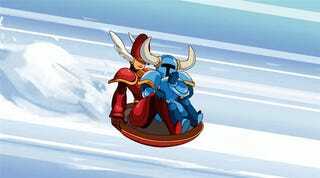 Considering Shovel Knight was created to resemble the sort of video games we played back then, this short (via Destructoid) is even sweeter still.